“I know I wrote it down, but where is that slip of paper? When is the appointment again?” The phone rang and I jotted down important information on a slip of paper intending to write it in a more permanent spot. But life intervened. Now the random piece of paper is nowhere to be found. Frustration abounds as I comb through the sticky notes on my desk for the one with the Dr. appointment info. These and other typical memory scenarios have one solution: organization. Everything has a home. Create a physical or cyberspace place to contain what you need to organize. Dates go in a calendar but where will the calendar live so you can always find it? Papers go in files but where will the files live-office, box, drawer, file cabinet, cyber cloud etc. Prioritize where to start. Most parts of our lives could benefit from a little organization. Prioritize what’s most important. Using prioritization is imperative within each project, task and even minute in some cases. Finish one thing before moving onto the next. (If possible) We cannot always control every situation, but following through on one thing instead of trying to do multiple things is always better. Eliminate Distractions. Interruptions and distractions kill memory as well as momentum on any work you are doing. You’ve already identified your priorities. Focus on the task at hand and nothing else unless an emergency pops up. Do little things right away. After coming home from the Dr. put the next appointment in your calendar. After getting off the phone, rewrite any additional info from the call on the slip of paper and put it into the file. Also, make a note on your to-do list and calendar on what follow-up actions you need to complete and when. Running low of something? Put the item on your grocery list right away. These little actions add up and help us stay organized. Maintain, Maintain, Maintain! Often we can get organized, but then slip back into our old ways of being scattered or not following through on things. It may seem easier to clean up by stashing things in drawers, a closet or a pile somewhere than to put things into the organizational systems we create. Look at a typical teen’s bedroom and you’ll see what I mean. But often in the time it takes to move things around we can put it away properly. No one can remember everything. 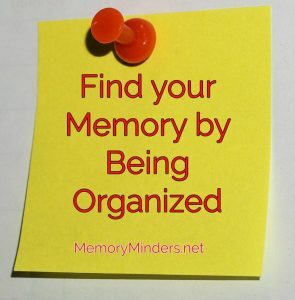 A good memory often can be about remembering where to find what you’re trying to remember. It’s a battle to get and stay organized. 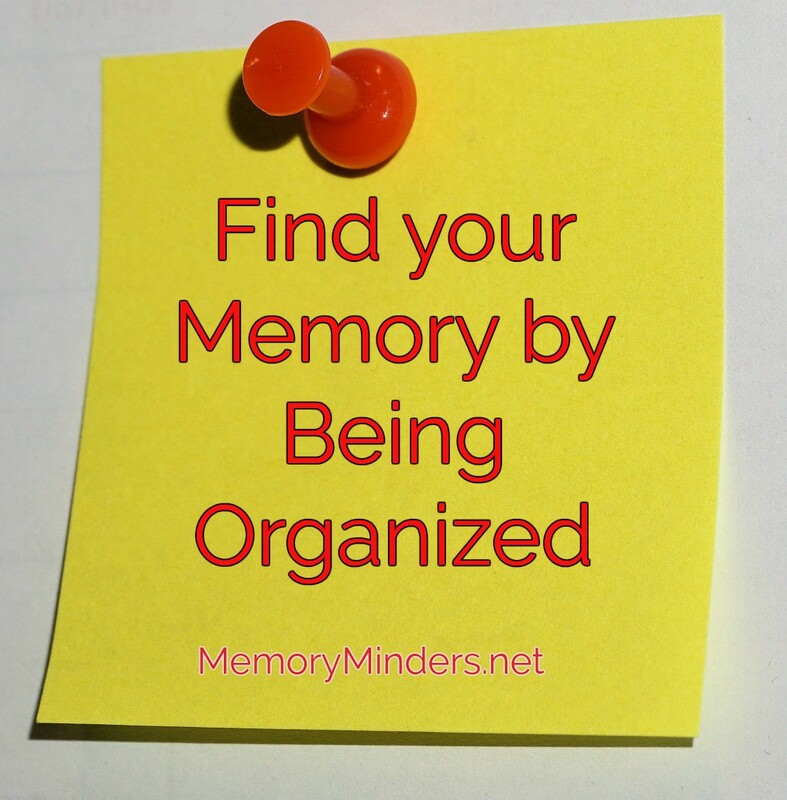 But a little organization goes a long way toward a better memory!